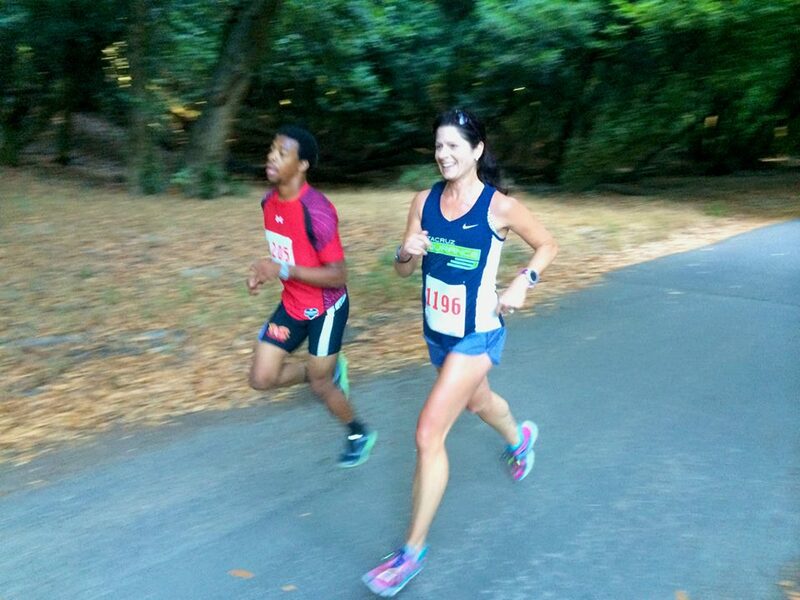 Race Thru the Redwoods (or as I like to call it, Race THROUGH the Redwoods) Race Recap – laps.lunges.leather. According to my coach, I start training for the California International Marathon right after Labor Day. Until then, I’ve been in maintenance mode and just running for fun. 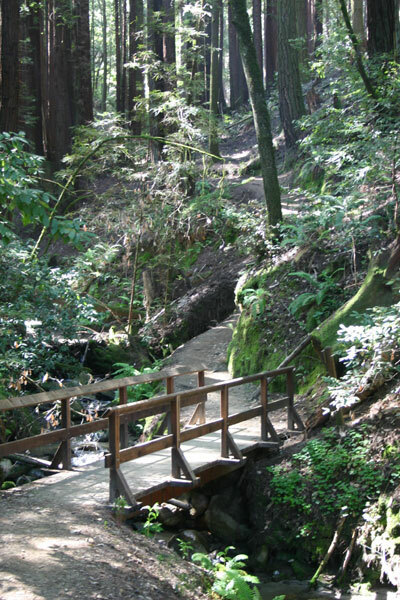 Up until late last week, I was planning to run a cross country race with my pal Meg, but when we realized that Santa Cruz Endurance would not have a full women’s team at the race, we decided to jump into the Race Thru the Redwoods instead. Here’s the thing… I don’t race trails (and if you have ever tripped on something as silly as a speed bump and broken your hand, all ideas of racing trails with no sense of irrational fear is long gone). For that reason, this race was simply for fun. Fun was what I had, and I actually surprised myself to boot! Do you see that hill? That’s right… There’s a big whopping hill right in the middle of this course. I figured that I could prepare myself a little better by asking Meg what the hill was like. Her response was, “Well…. I’ve never actually ran up the whole thing. It’s impossible.” Okay…. it must be a considerable hill since I think of Meg as strong on hills. With this in mind, I proceeded to do an 11 miler on Saturday with Elise, as she had 18 miles on her schedule. After that, I went to a Barre class/Practice session to prepare for another one of my new adventures – becoming a Barre instructor (stay tuned… mega blog post coming up on that soon). For final race prep, I put on some high heels and went out for a nice dinner with my hubby. This isn’t how I typically prepare for a race, but I knew this was just for fun and didn’t feel any race pressure. Sunday morning, I planned to meet Meg at her house to carpool to the race. Meg’s friend Dustin rode with us and was running the race as one of his first races ever. Go Dustin! We grabbed our bibs, did a warm-up mile and restroom break, shared some hugs with other teammates and lined up. Shortly after that, the gun went off and Meg and I used Mile 1 as a bit more of a warm up. This part of the course just meandered through some paved roads, and at the end of this mile the trail started. Shortly after this, I just went with a pace that felt comfortable. Mile 2 was pretty uneventful, and then… the hill started. Mile 3 was simply conquering the hill. I ran on the less steep parts and power walked the rooty, steep parts. In fact, I even got a few compliments on the speed of my power walking. Thank you fellow racers! Mile 4 was a rolling out and back section which was great because I could see some of the runners in front of me heading home. This was also the point that I realized that I was the 3rd place female. Cool! Right after the out and back section, the hugest downhill ever was included in Mile 5. Don’t misunderstand me… downhills are awesome, but these were super steep and I had visions of speed bumps in my head. It’s all good though… I now know a perfect route for Boston training this spring. Towards the end of Mile 5, we ended back up on trails for the last half mile or so of the 10k. This is where the magic happened… I was stoked to be back on the trail. Once I hit the trail, I had a moment of true appreciation of where I live and realized that trails make me happy. Running makes me happy (90% of the time), but to run on the trails felt really freeing. Prior to entering this last bit of trail, I’d been running pretty much neck and neck with a young man. When we got to the trails, he entered before me and I let him go. I know… you are probably thinking, “Silly girl! Go get him!” Believe me, I thought about it, but I also wanted to savor that feeling of running for joy. It was simply amazing! My race buddy… I’m not sure he felt the same way, but I say we’re friends. When all was said and done, I finished in 46:14 which was fast enough for 3rd Female and 1st in Age Group. Not bad! If I had to rank this race, I’d give it a 7/10. On the plus side, the race was easy to get to, parking was good, bathrooms were plentiful, and the course was well marked with helpful volunteers. For the negatives, there wasn’t race day registration, the shirts were regular old cotton t-shirts, the awards ceremony was odd, and there wasn’t an ounce of coffee to be seen even though there was a tease of a pancake breakfast after the race. Overall though, it is a race to put on your list for sure!